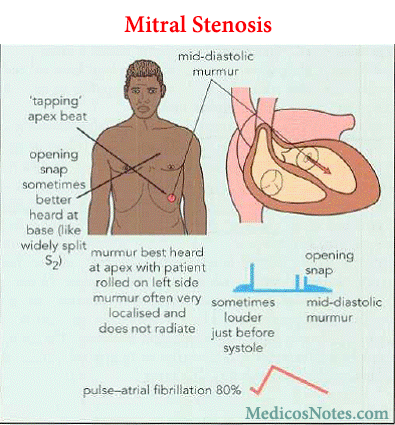 What are the cardinal signs of mitral stenosis ? 1. Normal or low volume pulse : Atrial fibrillation may be present. 10. Rough and rumbling low pitched middiastolic murmur with presystolic accentuation heard in mitral area. 4. Peripheral pulses can be absent due to embolism as a result of atrial fibrillation. Loud S1 indicate pliable anterior mitral leaflet usually apex beat is in normal position. If apex goes outward indicate RVH , it is downward and outward in LVH then think of other causes such as MR, AR, AS, systemic HTN. Diffuse apex beat is present in RVH.